The Integrated Science Center building houses three departments: Biology, Chemistry, and Psychology. A team of faculty members oversaw the installation of display screens that provide information on upcoming events and department news at three different locations in the large building complex. 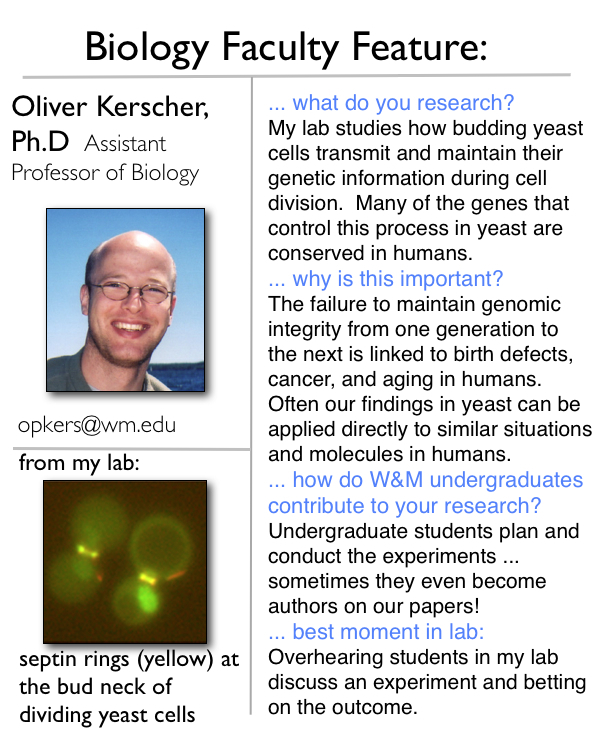 Biology faculty member Oliver Kerscher has single-handedly kept the screens up to date with useful information, timely announcements, and interesting images. A recurrent feature has been "Faculty Feature" which highlight a new faculty every month or so. Initially new faculty are featured, and now the rest of the faculty are being featured. Dr. Kerschers' Faculty Feature is shown below. To see other faculty features, select a name on the menu at left.